About 90 kms. from Pune, off the Pune Ahmednagar highway, is a sleepy little town named Nighoj. 2 kms. 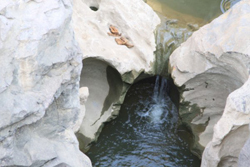 further up are Asia’s largest potholes formed in river Kukdi. Early Sunday morning, I began my exploration. After crossing Shirur (about 70 kms. ), a left turn and 20 kms. took me to Nighoj. The road was quite motorable. Just the last couple of kms. was in bad shape. And that was pre monsoon. If the authorities don’t do something about it now, the road in itself will be a serious competition to the river. The gorge which is just about 2 kms in length is hardly visible from a distance. But when I was at the edge, I was in a different world altogether. The river bed and the walls of the gorge had fascinating formations of rocks and potholes. Few of them had shapes like the blades of a mixer-grinder. I could only imagine water gushing through these blades when the water level goes up during the monsoon. Equally fascinating were other shapes that are hard to describe. Maybe pictures can help. While the location has enchanted geologists, the villagers remain enchanted for a different reason. Every year on Janmashtmi (day Lord Krishna was born), Nighoj village indulges in a little ritual. Over six hundred devotees pour into Nighoj to witness a miracle. At the stroke of midnight, villagers claim, an earthen pot filled with water emerges from the main well in the village, the pot is put on display for three days and after a grand procession, it’s immersed into the well so that it rises again the next year. Everyone here vouches for the miracle, saying nobody dares question goddess Malganga whose temple stands on the shores. The river, which flows by the village, takes a semi-circular turn less than 50 metres behind the temple, throwing up swirls and water currents that beat relentlessly against the hard basalt rock bed. 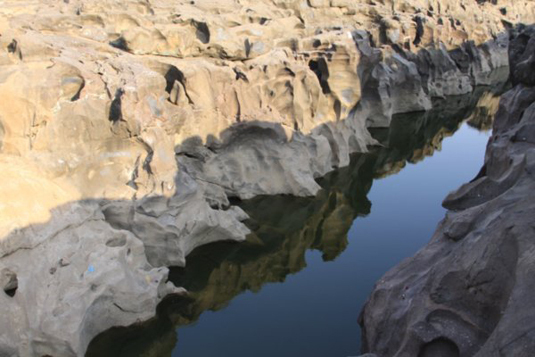 The river has done this for centuries, giving rise to one of the most fascinating vignettes of geology in the Deccan plateau. Potholes are formed by corrosion. Pebbles carried by the river are swirled around on the river bed. This action erodes the rock on the river bed forming potholes. Over time, they may widen and join with other potholes to form larger potholes, and the whole river bed is deepened. There are other theories doing the rounds about why and how the potholes are formed. But I will leave that for the experts. The sun was up and hot. 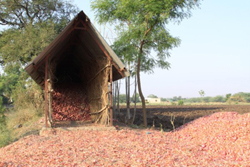 Time for me to turn back but not before exploring onion storehouses - there were many along the road.